This bear has been a long time coming. Over the years I have made a few Panda like Teds, I enjoyed using different colours but I thought it was time to visit the Panda again. I wanted to slightly modify the face shape without losing touch with my own look and I wanted to just give my own little twist to the design and get away from the usual approach to the black chest band. He is made from two shades of dense short Alpaca, and my first departure from "real" was the decision to make his contrast colour the rather nice custard yellow. 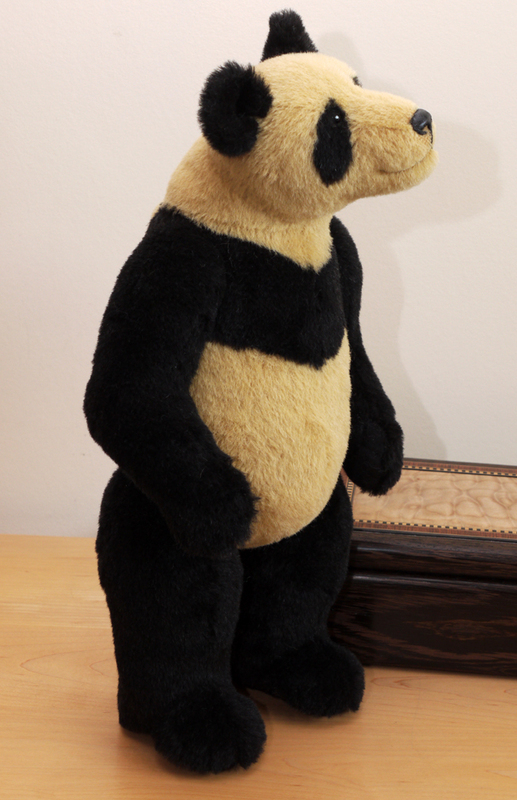 His proportions are not strictly realistic Panda, that was not my intention, but I have moved his face shape a little more in the Panda direction and altered the design of the nose embroidery a little. His eyes are inset on small discs of black felt to bring them out against the black of his eye patches. I very much enjoyed making him, but he took far longer than I expected, and as ever the work on the black fur proved very difficult, I had to do most of the hand finishing under a magnifying lamp to see what was gong on. 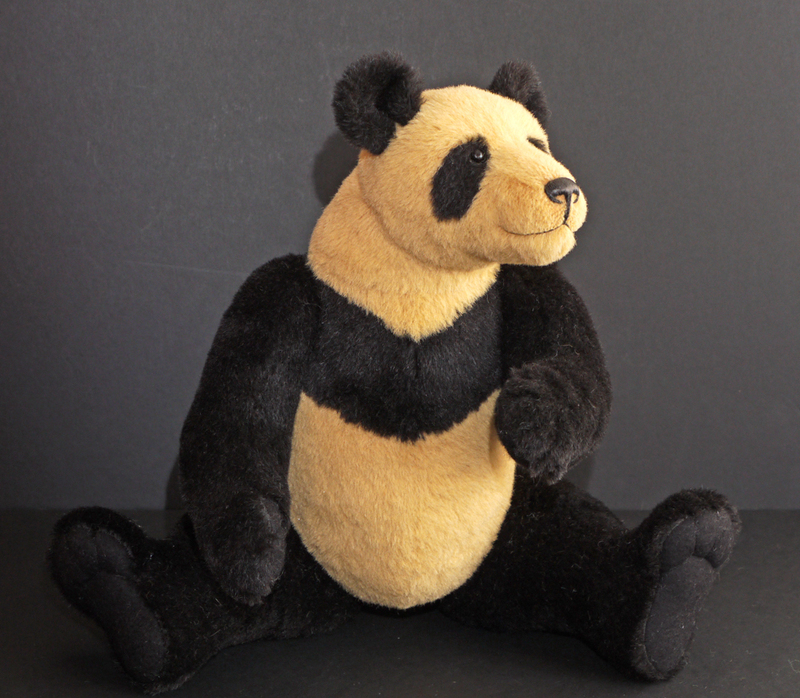 Pandas' shoulder colour is rarely regular and the idea of making it assymmetrical appealed but in the end I settled on breaking it at the back which involved sewing more circles into the pattern, tricky but very satisfying once finished. He has a double neck joint and I didn't want the colour change to be in the same place as a neck joint which again created extra pieces to fit in. For his feet I have kept to my preferred wool felt, the pattern has some of the shape built in which is then enhanced by sculpting, or pulling the toes. 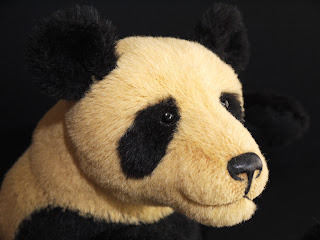 His eyes are my preferred vintage boot buttons and his nose is embroidered over a base to give a more three dimensional shape then set and wax polished, the remaining facial feature scissor scuplted over the snout and around the mouth. 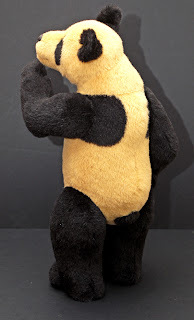 So all in all he is not a wild departure from my usual work but he has a few very small quirks which are there just to please me, I made him as a very personal special and I suspect he will be the only one for some time, I can't spend a whole week on one bear for a long while yet. And finally there is his name, Peregrine, I didn't want to give him one of those pseudo chinese double barrel names and Peregrine Panda has a nice ring to it so that's his name. Customers on my mailing list had a priority look at Peregrine so he already has a good home.